The little man and Hubby are both huge dinosaur fans so even before we visited, I knew Roarr! 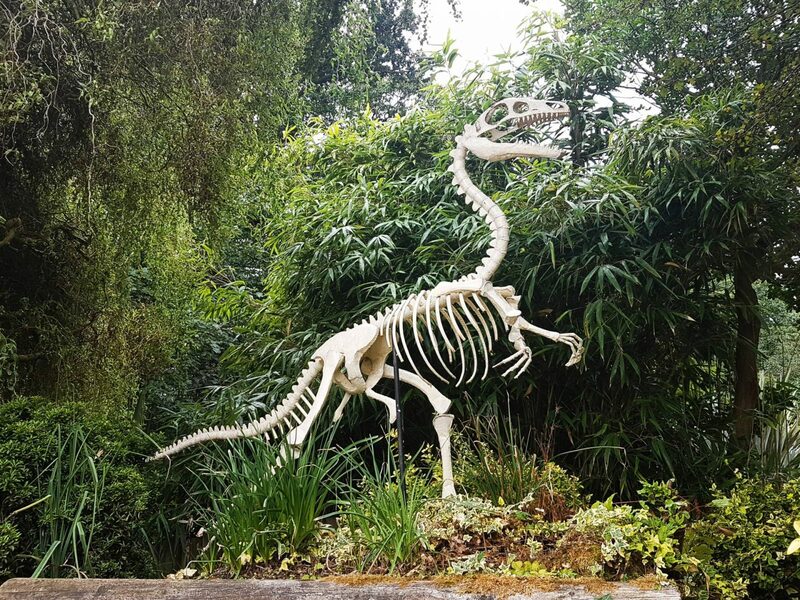 Dinosaur Adventure Theme Park in Norfolk would be a big hit. We arrived at the park at around 10.30, just as the heavens opened. We got through the entrance area very quickly, the queues didn’t last long and the member of staff was efficient and helpful when we told him this was out first visit. 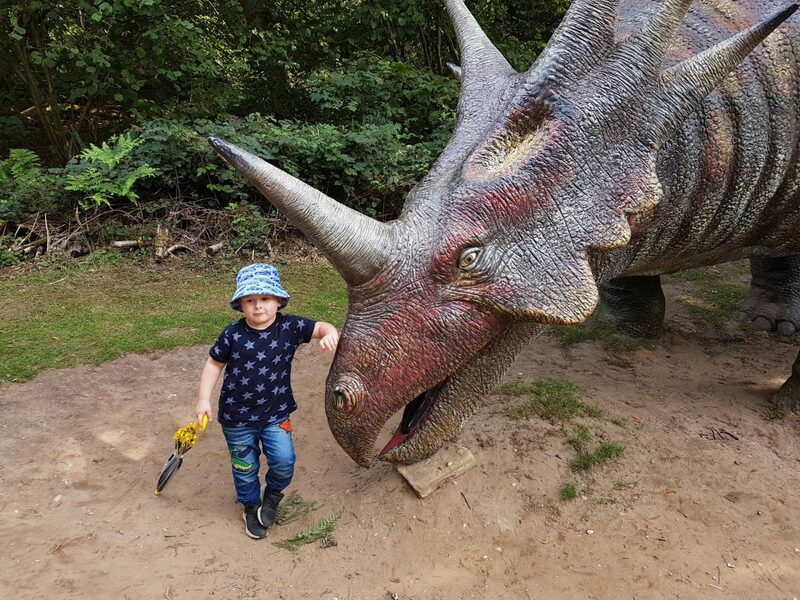 Once through the entrance, you’re into the area where the gift short and self service cafe are, you can also choose to have your photo taken in front of a green screen, a member of staff can then add dinosaur related features to your image and if you like them, you can buy it further round the park. 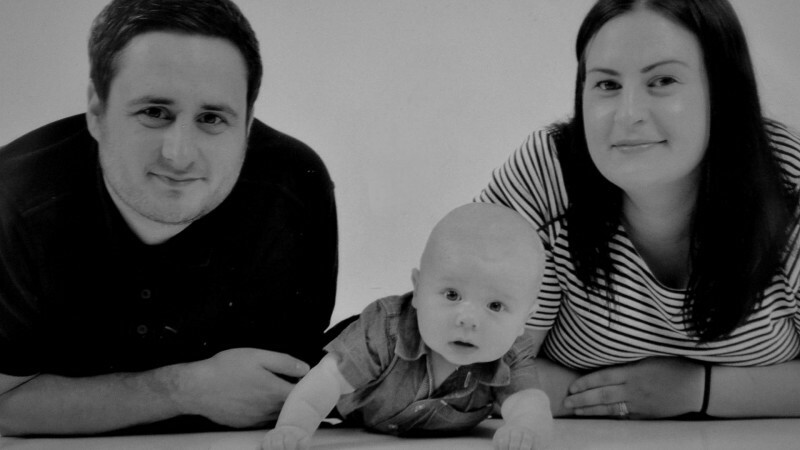 The little man had his picture taken but was looking in completely the wrong direction, so we decided against buying our pictures. 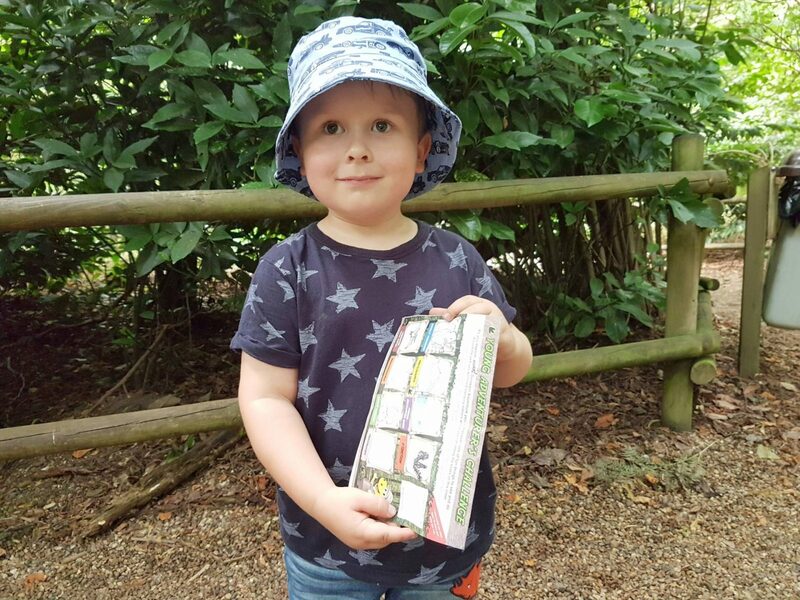 We were also given a map of the park and the little man was given his own sheet on which to collect stamps throughout the park. When the sheet is filled you can exchange it at the end of your day for a dinosaur medal, which was one of the little mans highlights of the day. The amount of things to do at Roarr is amazing! We were there until it closed at 6pm and still didn’t have time to do everything. 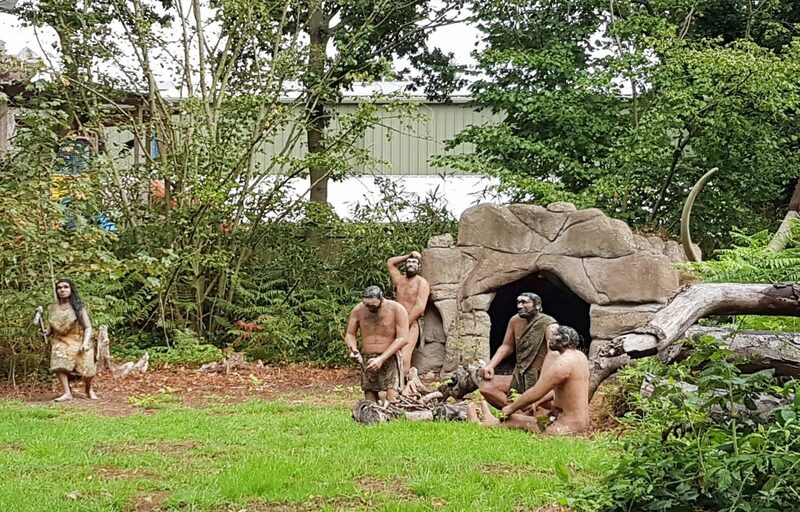 We started off with the Neanderthal Walk which meanders through the trees and has some displays and information plaques which were interesting to read. The walk then headed down to another part of the park and to where we found the Predator High Ropes. 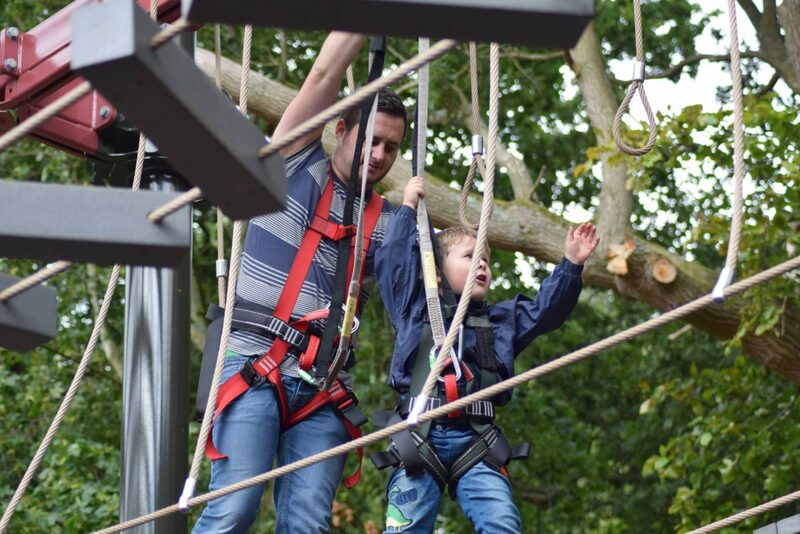 The Predator High Ropes are a relatively new addition to Roarr and the 35m long parallel sky rails with twin zip wires are the longest in Europe, with two levels of difficulty. I was really shocked that the little man wanted to go on, but he loved it and was so proud of himself. He’d worked up an appetite on the High Ropes so we decided to stop for an early lunch. We couldn’t decide where to eat between Explorers, Roarrs unique steampunk Jules Verne 20,000 leagues under the sea themed restaurant or take away fish and chips from Nautilus. 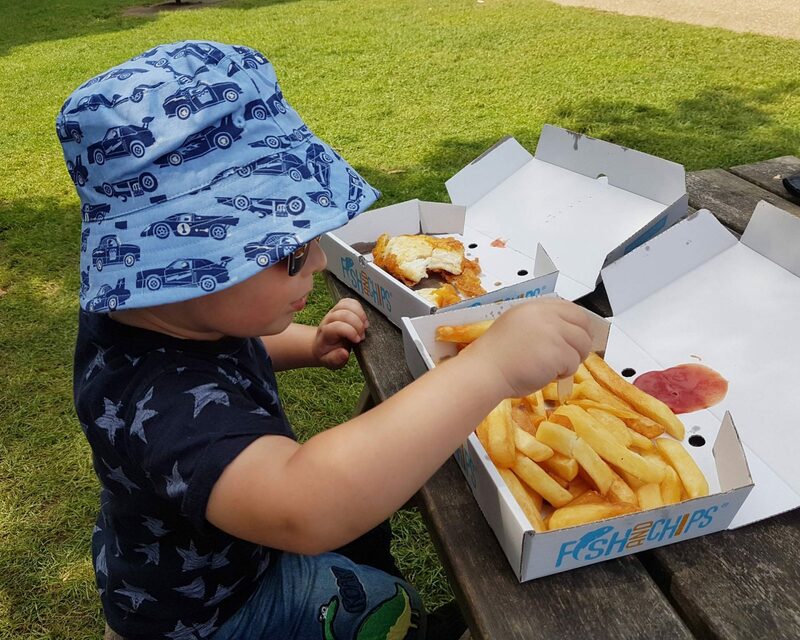 After much deliberation, the little man decided on fish and chips to eat on a picnic table. Cod and large chips cost £7.25 which was reasonable but we did wait for quite a while and we couldn’t order fish and chips together, just a fish and a separate portion of chips which was a little odd. The food was tasty and fresh though and just what we needed for a lunch time pit stop. After we’d eaten we headed to the Secret Animal Garden which was lovely. It was really quiet and such a nice area. It had various farm animals, especially the cute piglets and baby Guinea Pigs. 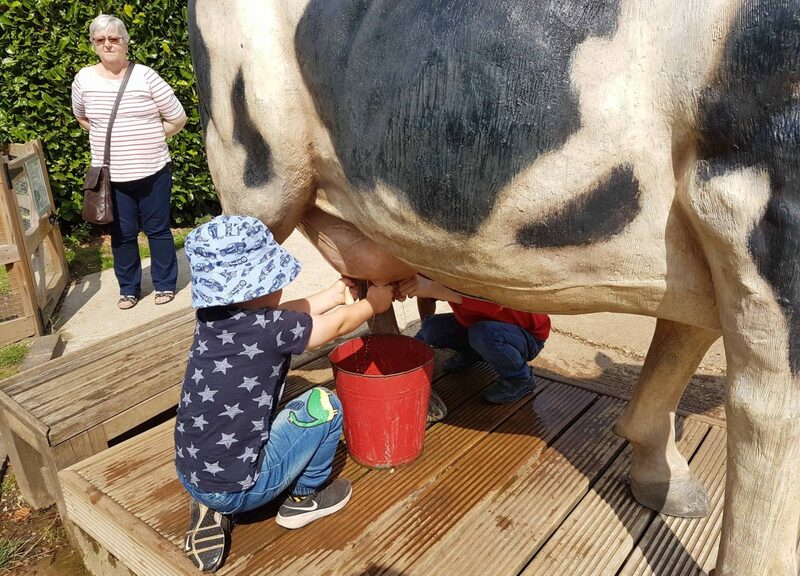 The little man could also ‘milk’ a cow which he said was lots of fun! Near the cow is the building where there are a range of activities and animal encounters on during the day. They’r writing down on a board so you can make a note of anything you’d like to see during the day. 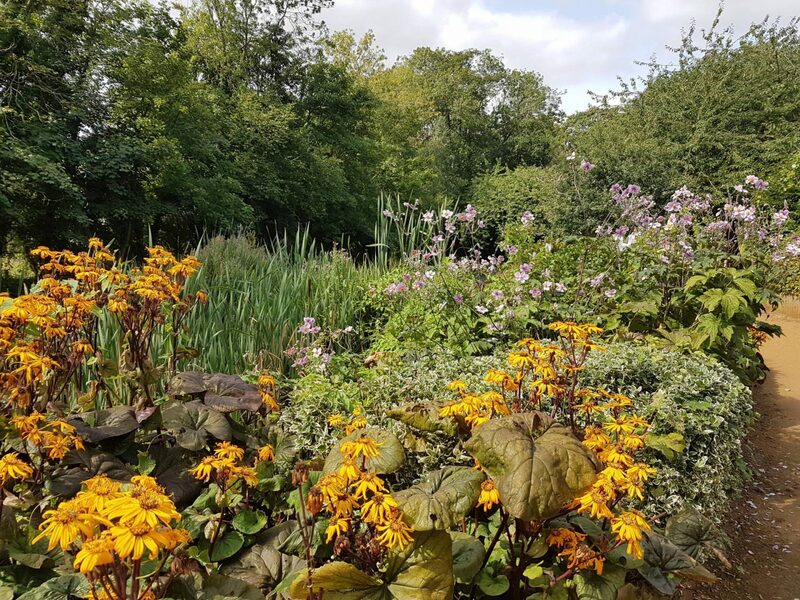 The Waterside Gardens were a lovely place to spend some time in the sunshine. It was really quiet so we were able to feed the crazy fish in peace and take 5 minutes on one of the benches. There was a river running along the edge of the gardens which was absolutely jam packed with fish. 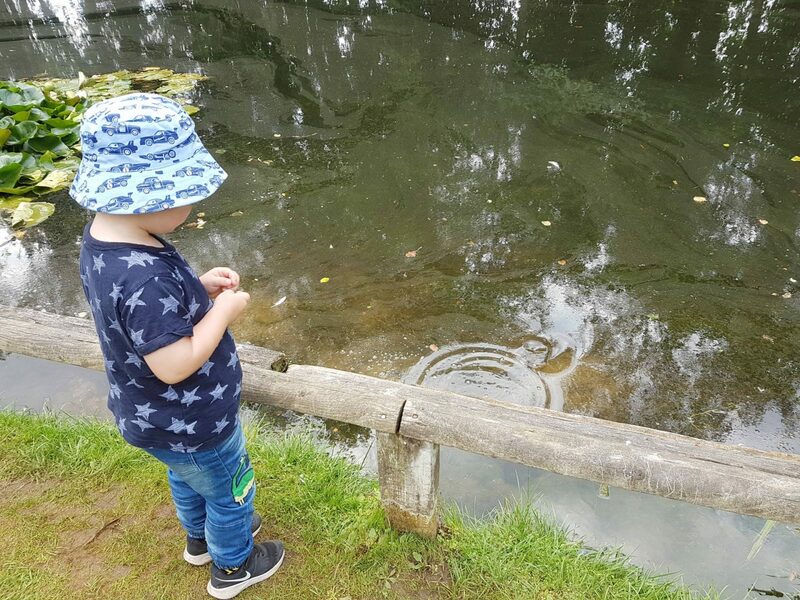 You could buy a handful of fish food to throw to them for 50p and the little man was enthralled by the fish jumping up and grabbing the pellets. One of my favrourite parts of the day was the Deer Safari. 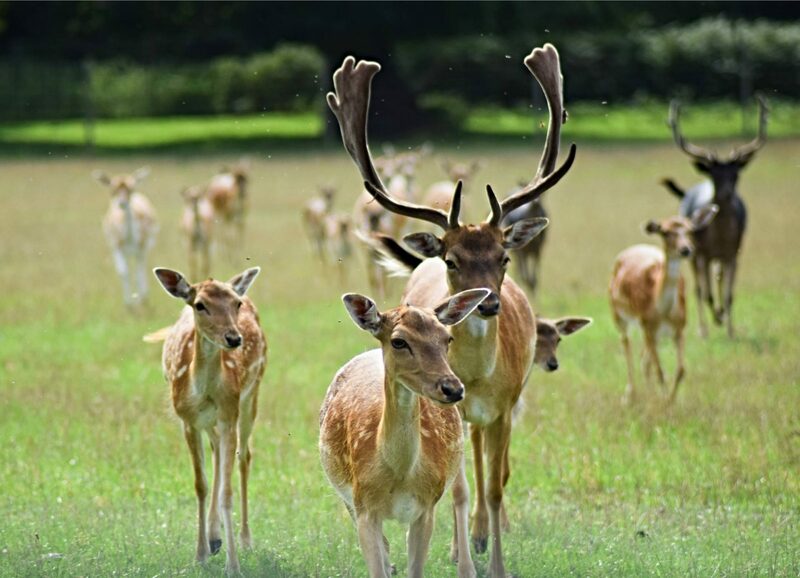 Visitors can ride in a trailer through the deer park whilst a member of staff gives a talk about the parks red and fallow deer. 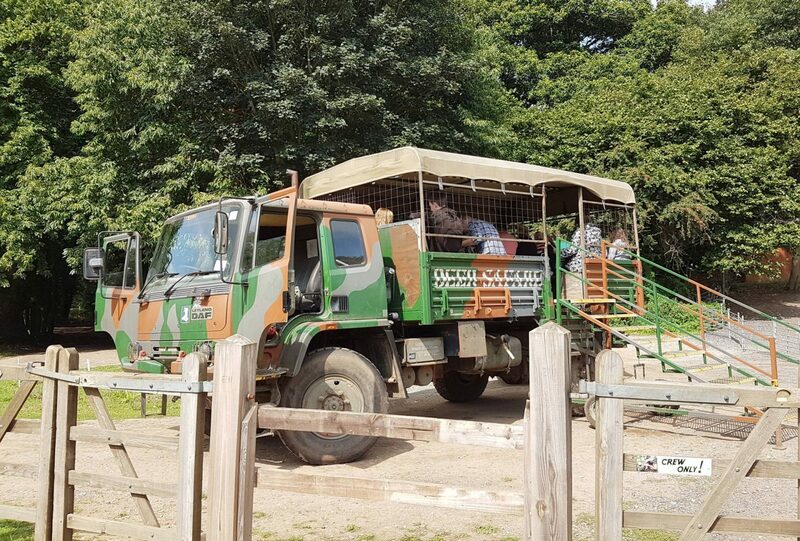 The Deer Safari has an additional charge of £1.95 for an adult and £1.50 for a child and needs to be prebooked. We’d tried to book on the earlier ride but it was full but luckily managed to squeeze in ON the last ride of the day and I’m really glad we did. A large truck and trailer takes visitors to a quiet field where a large group of deer approach the vehicle. A member of staff gave an interesting talk about the animals and through the deer some food so we were able to get some great photos of them. 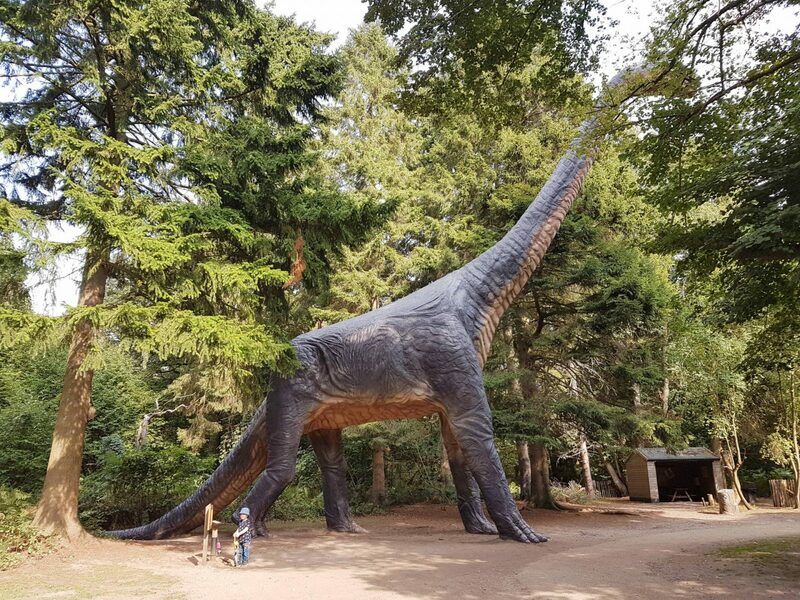 We all loved the Dinosaur Trail through the woods. It was really quiet so it really felt like we were in Jurassic Park! There are dinosaurs, field stations and interactive sounds dotted along the way. The little man really enjoyed checking out the dinosaurs and loved the noises they made. After following the Dinosaur Trail back up to X-Tinction which is a fab Dinosaur excavation pit. It has two large sandpicts and some sand trays where children can ‘dig’ for dinosaur bones and fossils. The little man loved pretending to be a Paleontologist, using a brush to ‘discover’ the hidden treasures underneath. 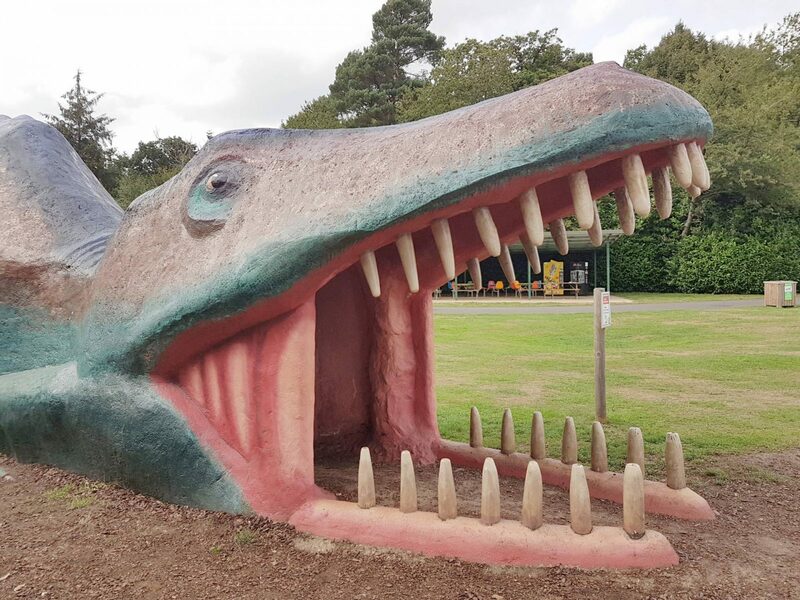 Next to X-Tinction is a giant dinosaur that children can run inside the full length of and go down a slide through it’s mouth or tail. The little man absolutely loved it and we had to coax him away from it so we could move onto something else. There’s also an extensive adventure play area. It’s spread over a huge grassed area with plenty of benches and trees dotted around. The majority of the play equipment is made form wood and there’s a dedicated under 7’s area called Tiny Terrosaurs. The little man had lots of fun running across bridges, whizzing down slides and wearing himself out. By the time we made it to Dippy’s Splash Zone the sun was shining so I knew we wouldn’t be able to walking past without a visit. What’s a day out without a dip in the water!? 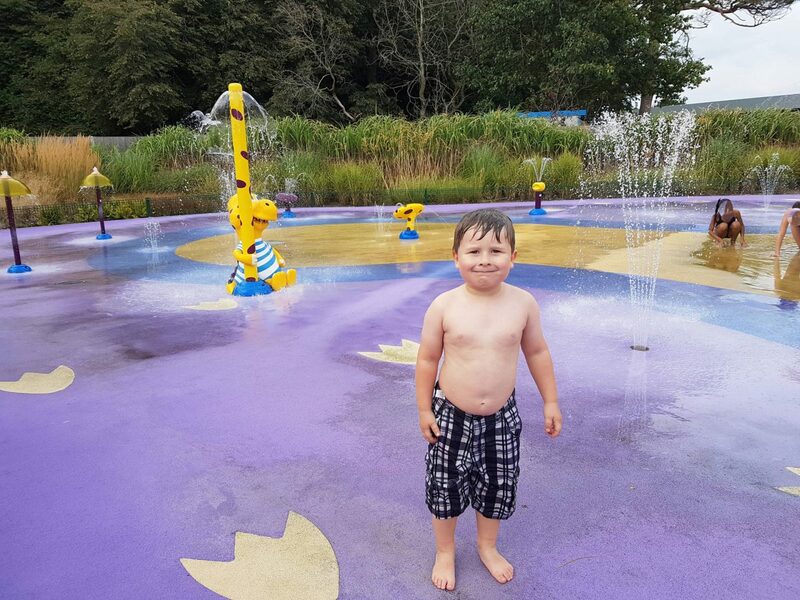 The splash zone area is open between the months of March and September depending on the weather and temperature. It’s not a very large area but a great idea for warmer days. It has a slide and bucket that fills before splashing down on the children below. It also has lots of benches, seats and lockers which you can hire for £1 so you can stash your valuable away from splash-happy children. 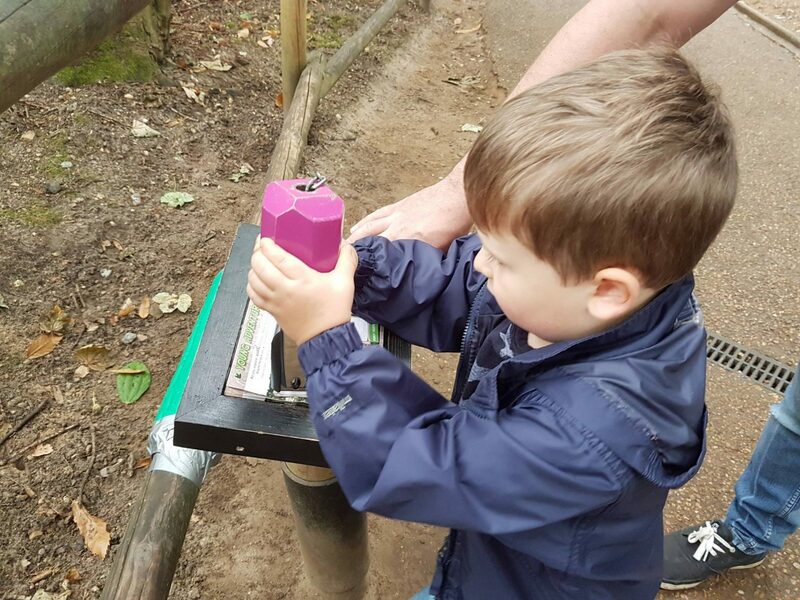 We headed off to find our very last stamp in Lost World A-Mazing Adventure which was a small maze hidden in amongst the trees. It had a fun wobbly bridge and more dinosaurs hiding in the undergrowth. 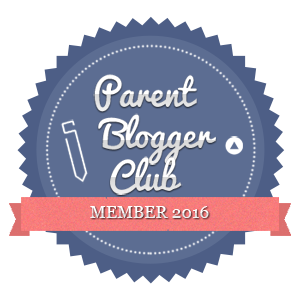 The final thing we managed to squeeze in was a quick visit to Dinomite Indoor Play Area. 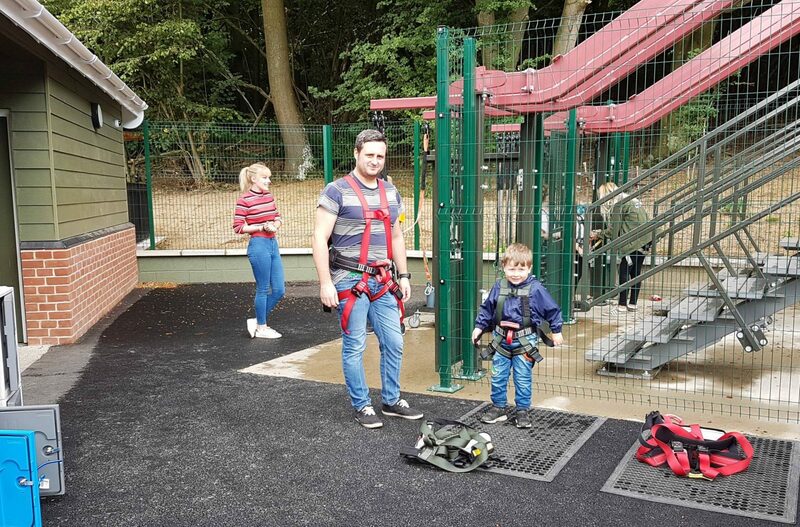 The indoor play area is suitable for all ages so I imagine can get quite busy. We visited at 5.30, just before the park closed at 6 and it was almost empty. It has 3 different slides and a special under 5’s area. The little man really enjoyed the multi coloured slide. 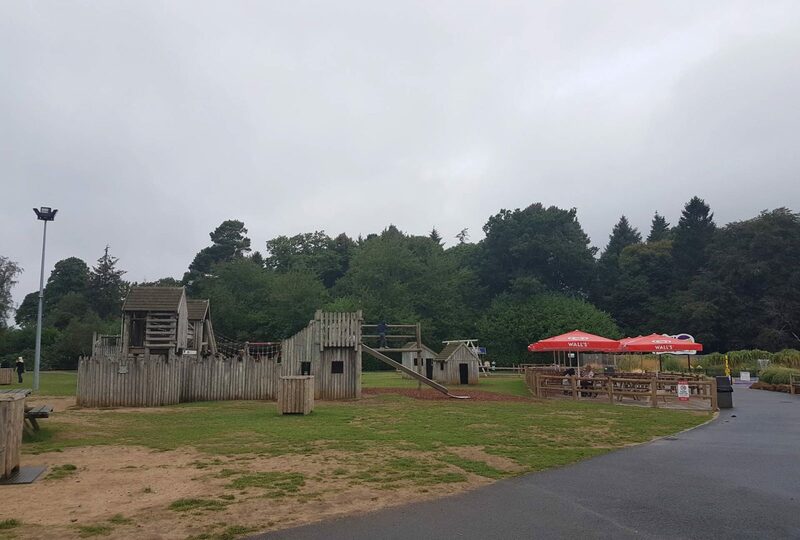 Riders had to sit in a hessian sack to zip down and he must have managed to squeeze in a million slides before it was time to leave.Right next to the play are is a 200 seater café which also has an outside terrace which would be perfect for warmer days. Sadly, the park was closing so we missed out on a visit to Pterodactyl Treehouse but it looked fab. You can check out some of the things we did in the video below. Tickets for Roarr! can be bought in advance online and will save you a few pounds. An adult ticket will cost you £14.95 and a child aged 3-15 will be £16.95 (£16.95 and £18.95 if you buy on the door). After the 1st of October, entrance tickets are slightly reduced after the 1st of October so this is the cheapest time to visit. We absolutely loved our visit and will definitely be returning. We spent the full day at the park but didn’t have time for some of the bits. 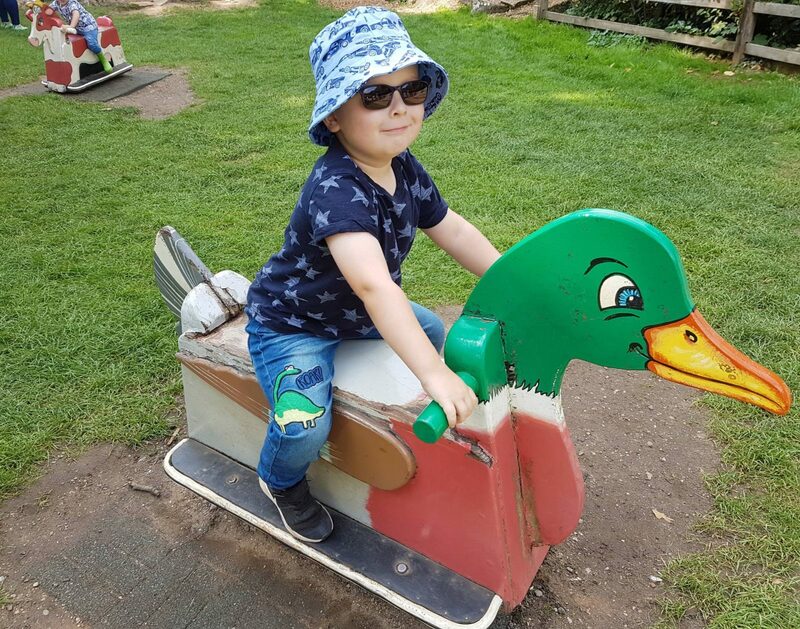 It’s perfect for dinosaur fans but the children don’t have to love dinosaurs to love the park. There are so many things to do and although the entry tickets aren’t the cheapest, I do think they’re very good value for money as we didn’t spend too much extra whilst in the park. I wish we lived closer so we could take advantage of their annual passes.